If you ask me what eye cream that worth splurging. The answer would be Menard Embellir Eye Cream. I think Menard is lucky enough that I got to try most of their products when I’m not too picky with ingredients. I tried most of the stuff with a clean slate and no expectation, despite the Embellir line being a very pricey line. The three products from the line that caught my attention are the liquid (a hybrid of hydrating toner and emulsion), extract (basically a serum and yes I need to review this soon) and lastly the eye cream. What is it? Menard Embellir Eye Cream, the eye cream from one of the most expensive lines sof Menard. After this line, they still have the ultra luxurious line called Authent. How much? It’s Rp 2,832,000 for 15 ml and you can get it online at Sociolla. Who is it for? For someone willing to splurge. Tried everything out there with no result. Have either dryness issue on the eye area which leads on fine lines or have deep fine lines and sagging issue. This could be the eye cream that answer your prayer. It took me long enough to review this one. 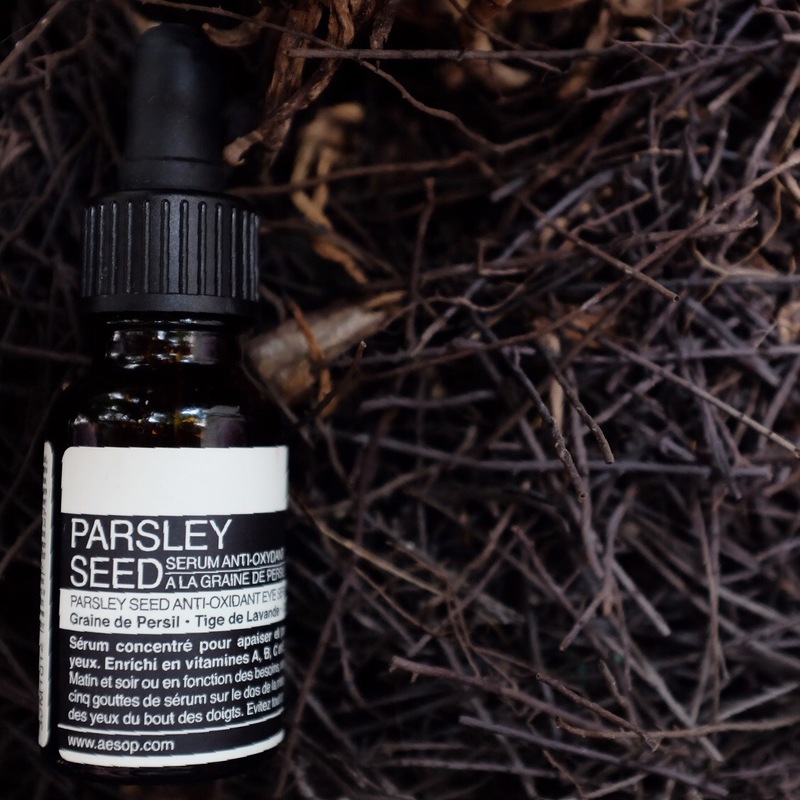 To date, I’m still using the Aesop Parsley Seed Anti-Oxidant Eye Serum. It has been probably 6 months since I first used it or probably longer. I want to review it sooner, but I want to see how it wage against other eye cream/serum that I had. I have to say, this is by far my favourite eye products of all time next to Menard Embelir and Grown Alchemist. I’m indefinitely partial when it comes to Aesop (and Grown Alchemist), both brands are lovely and hailed from my favourite cities in the world: Melbourne. It smells like home. Melbourne is filled with organic products hence most of the corners of the city smell like organic product. This eye serum texture feels like oil, but if I remember correctly the Sales Assistant said it’s not an oil serum. Fair enough because it doesn’t feel oily upon application and it absorbs fast. It’s filled with vitamin A, B, C (Magnesium Ascorbic Phosphate) and E (Tocopherol). It promises to hydrate, protect and nurture the skin around the eyes. Nothing too fancy. The price however is quite fancy at around £55 or AU$81 for 15 ml. Quite something isn’t it? It’s also much pricier in this part of the world: Singapore and Malaysia, because we have none in Indonesia. Semenjak keranjingan baca Caroline Hiron saya jadi sering mencatat produk-produk yang dipakainya. Tapi sayangnya kebanyakan produk atau malah hampir semua yang dipakainya tidak ada di Indonesia. Nasib! Jadi biasanya kalau memang secara ulasan saya ngiler, langsung, deh masuk ke daftar wishlist saya. Kalau kebetulan ada yang menawarkan mau titip apa langsug deh pilih-pilih dari daftar tersebut. Dua produk terakhir yang saya beli karena ulasannya atau sekedar karena sering lihat di akun﻿ Instagram-nya adalah Hylamide SubQ Eyes dan Merumaya Cleansing Balm.